Papa John’s chairman John Schnatter has resigned after admitting he used the N-word in a role-playing call last May. The pizza chain released a statement Wednesday night saying that it had accepted Schnatter’s resignation. Papa John’s will appoint a new director soon and Olivia Kirtley will act as the company’s lead independent director in the interim period. 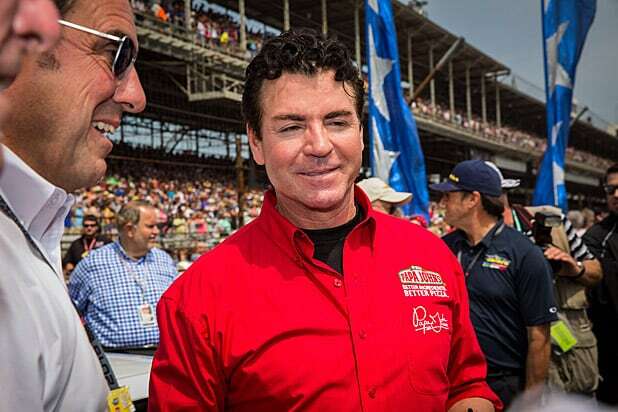 Schnatter made the racial slur during a role-playing call between Papa John’s executives and marketing agency Laundry Service. It was designed as an exercise for Schnatter to prevent a public-relations crisis but clearly backfired. According to Forbes, Schnatter was asked how he would distance himself from racist groups online and replied: “Colonel Sanders called blacks n—–s,” Schnatter then complained that Sanders never faced public backlash, Forbes said. He also reportedly recalled his early life in Indiana, saying people there used to drag African-Americans from trucks until they died. The University of Louisville also said that Schnatter has resigned from its board of trustees, effective immediately. The patriarch of the famous pizza chain stepped down as CEO of the company in December after months of turmoil following his criticism of the NFL over player protests, blaming them for low pizza sales. Papa John’s had been an official sponsor of the NFL and Schnatter was featured in an array of commercials with legendary quarterback Peyton Manning. The chain and the league have since parted ways. You'll be hard pressed to find a franchise that has found such longevity in such a ridiculous concept as "Teenage Mutant Ninja Turtles." The series is loaded with bizarre quirks, with one of the most famous being the turtles' undying love for pizza. It's one of the most well-known examples of this foodstuff in modern cinema, but it's far from the only one. Arguably the most iconic moment in Mike Myers' career is his lampooning of product placement deals in "Wayne's World," a scene that starts with him taking a nice bite of some Pizza Hut with the logo on the box perfectly angled towards the camera. Lenny's Pizza on 86th Street in Brooklyn became immortalized by "Saturday Night Fever," when John Travolta asked for a couple slices from the pizzeria during the movie's famous opening credits sequence. Pizza Hut also got some product placement in "Back to the Future Part II," which predicted that in the year 2015 we'd be buying dehydrated pizzas from the chain and using Black & Decker hydrators to cook them in seconds. Alas, we still have to use an oven for our frozen pizzas. Most of the clips here might make you hungry, but not this one from "Spaceballs." The grotesque costume used for Pizza the Hutt, Mel Brooks' parody of Jabba the Hutt, used actual cheese. Here's something much more appetizing: pizza margherita from Naples. Anyone who has had the privilege of taking a trip to Italy knows that it is just as delicious as Julia Roberts makes it out to be in this scene from "Eat, Pray, Love." That's not the first time Julia Roberts crossed paths with pizza in her movie career. In fact, her first role in 1988 was a pizzeria waitress in "Mystic Pizza." In 1995, the Internet was still an exotic, unknown invention for most people. That led to movies like "The Net," in which Sandra Bullock demonstrated the magic of computers by ordering a pizza without picking up the phone. Spike Lee's breakthrough film "Do The Right Thing" centered around Sal's Pizzeria in Brooklyn, an Italian-American-owned restaurant in a black neighborhood. Tensions and prejudices quickly emerge at this pizzeria, resulting in one of the most unflinching takes on racial relations in movie history. As the "Nightmare on Elm Street" series went on, Freddy Krueger became increasingly cartoonish with his grisly kills. In this scene from the fourth film, he torments one victim with what he calls "Soul Pizza." Pizza Planet is a major part of the "Toy Story" series, and in the second film, Buzz led the rest of the crew in driving a delivery truck from the pizza chain to rescue Woody. In fact, that very Pizza Planet truck has been included as an easter egg in every Pixar movie ever made, with the exception of "The Incredibles." In the opening scene of "Spider-Man 2," we see that Peter Parker is now delivering pizza as well as taking photos for the Daily Bugle to pay the bills. Unfortunately, trouble strikes, forcing Peter to choose between his duties as Spider-Man or keeping his job. As bad as that situation is for Peter, other delivery boys in comic book movies have had it worse. In "Deadpool," one was targeted by Wade Wilson for stalking a girl in a scene that introduced the Merc before he became Deadpool. Some people like to blot grease on a pizza to get rid of the excess fat and oil. In "Along Came Polly," Philip Seymour Hoffman added on as much grease as he could while giving horrid romantic advice. It's one of the sleaziest performances in the late actor's career. How does a little kid get a pizza when he's alone with no money? Kevin from "Home Alone" figured out a way with a little help from a classic comedy. Closing things out are the Ninja Turtles with a pizza scene from the 1990 live action film that marked the peak of their popularity.